Where do I send my booth materials? 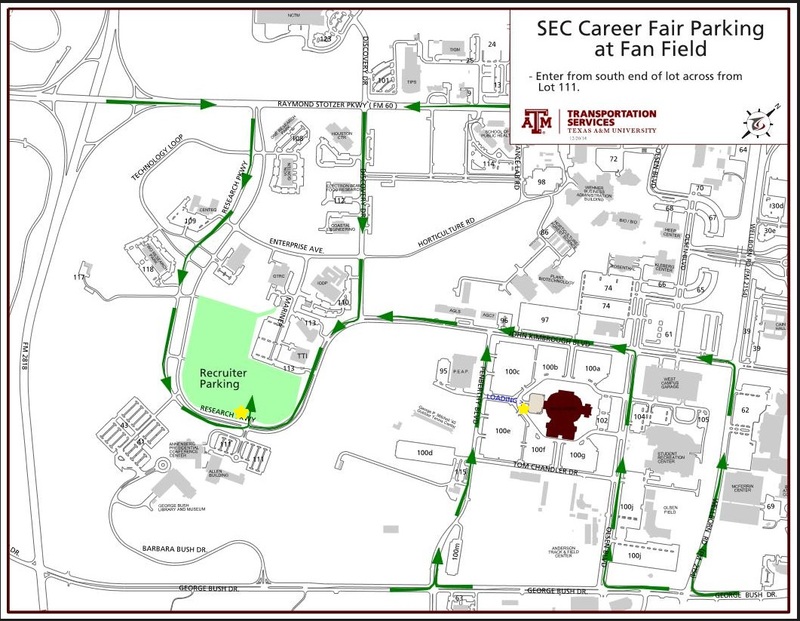 To reduce congestion, free recruiter-only parking will be available in the Fan Field Parking Lot near the Texas A&M Hotel and Kyle Field. Please see the static map and navigational map for more information. If they prefer, recruiters can pay an hourly rate to park at West Campus Garage. Other paid parking options can be found at http://transport.tamu.edu/Parking/visitor.aspx. Shuttles will be provided from 6:30am-9:30am and 3:00pm-5:00pm to transport recruiters from the lot to the exhibit venues. A regular university bus route (Route 05) runs throughout the day and drops off at the Fan Field Lot, so recruiters are welcome to utilize this free service for travel during the day. More information on bus routes can be found at http://transport.tamu.edu/BusRoutes/. Login with your corporate email and password. To verify your email or create a new account, enter your corporate email address (johnsmith@companyname.com) on the right side of the page. Follow prompts to create an account. To register for the current fair, click on the "Register Your Company" link. Follow the prompts through the registration process. You will receive a confirmation email upon registering. How can I confirm/change my registration? A brief summary of your registration is posted at the top of the the next page. To make changes, click the "Update Registration" link on the right. Cycle through the next few pages to see what you are registered for right now, and make any necessary changes. How do I pay for the Career Fair? Click "View Current Invoice" on the Company Dashboard. To download a PDF, click "Download PDF Version". What is SEC's Tax ID Number? Where can I find SEC's W-9 form? Email careerfair@sec.tamu.edu to request a copy of our W-9. How can I reserve private interview rooms? Private interview rooms can be reserved through the Texas A&M Career Center (separate from Student Engineers' Council) at 979.845.5139. Call early, as many companies will reserve these rooms for the days following the fair.